An inspiring brand known as HempWorxCBD is not only an honest company, they are very transparent too. Not only do they share their operating procedures willingly, they even tell their customers precisely where they get their raw hemp plants from. Another outstanding thing about this company is the quality and care that they provide their customers. Did you know that they share dosing guidelines with their customers? These guidelines are based on specific medical conditions that can be quite serious. They obviously want their customers to feel better and pain-free and they tell them the best possible way to achieve stress and pain management with their products. Just to make sure we’re on the same page, CBD does not have approval from the FDA at this time. It is not technically considered medicine, so legally they have to tell you that these products cannot prevent, cure, or treat specific diseases. Yet HempWorx CBD oil helps many people in a number of different ways. This company is based out of the United States and gets their hemp from Pilot Research Farms in Kentucky. They also use a high-level CO2 extraction process to extract the CBD from the raw material. In this thorough HempWorx CBD oil review, I’d like to tell you about their products, share their pricing structure, and even tell you about the positive effects on anxiety and stress levels that I’ve noticed personally when using these products. To discover their best and most effective products, you can visit their website to place your order today. HempWorx CBD: Who Are They? The business model presented by HempWorx CBD is thought-provoking to say the least. Instead of performing their own marketing and advertising, they connect with other retailers online and in physical brick-and-mortar stores to share their products with the world. The benefit of this model doesn’t have anything to do with their products and the quality whatsoever. In fact, the quality is outstanding because they work with Pilot Research Hemp Farms, based in Kentucky, which is known as one of the top sources for raw hemp plants in the US. The industrial hemp in Kentucky is of the highest quality. Basically, people feel this way because the climate in the area combined with the natural content of the soil produces strains of hemp that are very rich in CBD. Even more interesting, many experts and CBD enthusiasts believe Kentucky hemp is better than strains found in California and Colorado. I’m also excited to tell you that HempWorx ships their products to all 50 states in the US – and they even ship to other parts of the world – and have incredibly quick shipping services, which means you’ll get your CBD in a better than sufficient amount of time once you’ve ordered it. As I close out this review at the end, I’ll even tell you about the products I prefer and the effects that they’ve had on me personally. They use pure CO2 extraction to extract the CBD from hemp. When you couple this with the fact that they get their hemp from Pilot Research Farms in Kentucky, you know that the end product is going to be potent, pure, and top shelf. All of their products are made in the United States. In this day and age, it’s more difficult than ever to find companies that produce their products strictly in the US. That’s why I’m happy to tell you that HempWorx aren’t running part of their operation in Asia like many other CBD companies. Their company is as American as apple pie and they intend to stay that way. They have very fast shipping. This is important because you may run out of their product from time to time and forget to order it. Their quick shipping guarantees you’ll be able to get CBD products fast without having to wait for backorders. And since they also keep a huge amount of stock on hand at all times, they’ll ship fast and get it to you quickly without having to pay extra for same day shipping. They offer money-saving bulk purchase deals. If you run a dispensary or retail storefront, you can buy their CBD oils and other products in bulk for wholesale prices. By three, get one free. You and thousands of other people like you who order a monthly CBD supply are very lucky whether you know it or not. This deal basically amounts to getting a 25% discount every four months, or all year round. Their hemp is sourced from Kentucky. They have a deal in place with hemp farms in Kentucky who manufacture very high quality hemp. This means HempWorx has some of the purest, most highly rated products available in this space. If you are a new CBD user, you’ll find helpful, intelligent information on the HempWorx website. This info will guide you to the best way to treat certain conditions like experiencing less anxiety, treating epilepsy, increasing appetite, sleep disorders, Huntington’s disease, and more. But this is a bit of a tricky situation. CBD does not have FDA approval as a medication, so they probably shouldn’t be sharing this information so freely because it may get them in trouble. They also aren’t considered professionals in the healthcare industry. So, again they could end up creating a problem for themselves. On their website, they have a legal disclosure and FDA disclosure below their guidelines for dosing. They even say that the guidelines they share haven’t been evaluated by the FDA. They also say that their guidelines weren’t created to prevent, treat, or cure any diseases. Lastly, and this has nothing to do with federal regulations, they make you sign up for their website before you can actually buy anything. This is kind of annoying since you may prefer to sign up at the time of purchase instead of being forced to give your information earlier. Unfortunately, I occasionally suffer from anxiety and panic attacks. While not chronic, I take CBD products three times a week to keep my stress at bay. And on occasion I may need to take it to stop a full-blown panic attack in its tracks. The 15 mg CBD oil is great for panic attack episodes. So if you’re like many, and you’d rather avoid taking Xanax or Zoloft, CBD is an effective alternative option. Occasionally I wake up with generalized anxiety in the mornings as well. But when I take CBD oil, my anxiety levels off and I feel good throughout the day. HempWorx CBD Topical Cream – there are three varieties of this product currently available. Your options include Revive, Renew, and Relief. Revive is exciting because it’s an antiaging cream that contains collagen and CBD oil. The Renew cream is also a very effective antiaging cream with other potent ingredients. Relief is perfect for those suffering from joint pain and soreness because it acts as an icy muscle rub with CBD content within it. HempWorx CBD Oil Herbal Drops – these drops of CBD oil come in peppermint or natural flavors. The 500 product contains 10 mg of CBD, and the 750 product has 15 mg of CBD. HempWorx CBD Oil for Pets – their CBD pet oil was specifically derived to treat the pain and suffering of your household pets. They even offer a dog treat that is beef flavored and contains 2.5 mg of CBD, which is perfect for large and small dogs alike. Topical Creams – at this time, the Relief, Renew, and Revive products all costs $69. 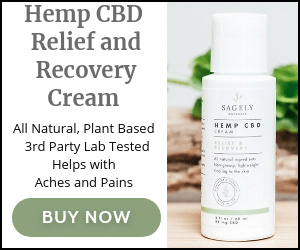 CBD Oil – the 500 version of their CBD oil costs $69. And the 750 version of their CBD oil costs $89. Pet Products – the 250 CBD Oil for Pets and the CBD Pet Treats both retail for $69. At the end of the day, after personally using a number of different HempWorx CBD products, I can wholeheartedly recommend this company to my readers. In fact, their CBD oil has become a regular part of my weekly routine since I use it at least three times a week to quell my panic and anxiety attacks. Also, their buy three get one free deal is pretty great. Since I use this stuff regularly, I literally save about 25% each year, or 25% every four months, depending on how you look at it. Lastly, these high quality HempWorx products are easy to get because they keep their online store heavily stocked and you can also find their products in the stores of your favorite CBD retailers. This is perfect for anyone who ever needs to restock their CBD supply quickly without any difficulties whatsoever. Shane Dwyer is a cannabis advocate who isn't afraid to tell the world about it! You can find his views, rants, and tips published regularly at The 420 Times.